Many observers consider sanctions to be a central element of U.S. policy to counter Russian malign behavior. Most Russia-related sanctions implemented by the United States have been levied in response to Russia’s 2014 invasion of Ukraine. In addition, the United States has imposed sanctions on Russia in response to human rights abuses, election interference and cyberattacks, weapons proliferation, illicit trade with North Korea, support to Syria, and use of a chemical weapon. The United States also employs sanctions to deter further objectionable activities. Most Members of Congress support a robust use of sanctions amid concerns about Russia’s international behavior and geostrategic intentions. Ukraine-related sanctions are mainly based on four executive orders (EOs) the President introduced in 2014. In addition, Congress passed and the President signed into law two acts establishing sanctions in response to Russia’s invasion of Ukraine: the Support for the Sovereignty, Integrity, Democracy, and Economic Stability of Ukraine Act of 2014 (SSIDES; P.L. 113-95/H.R. 4152) and the Ukraine Freedom Support Act of 2014 (UFSA; P.L. 113-272/H.R. 5859). Additional sanctions on Russia may be forthcoming. On August 6, 2018, the United States determined that in March 2018 the Russian government used a chemical weapon in the United Kingdom in contravention of international law. In response, the United States launched an initial round of sanctions on Russia, as required by the Chemical and Biological Weapons Control and Warfare Elimination Act of 1991 (CBW Act; P.L. 102-182/H.R. 1724, Title III). The law requires a second, more severe round of sanctions in the absence of Russia﷿s reliable commitment to no longer use such weapons. The United States has imposed most Ukraine-related sanctions on Russia in coordination with the European Union (EU). Since 2017, the efforts of Congress and the Trump Administration to tighten U.S. sanctions on Russia have prompted some degree of concern in the EU about U.S. commitment to sanctions coordination and U.S.-EU cooperation on Russia and Ukraine more broadly. The EU continues to consider the possibility of imposing sanctions in response to Russia’s use of a chemical weapon in the United Kingdom, human rights abuses, and cyberattacks. Debates about the effectiveness of U.S. and other sanctions on Russia continue in Congress, in the Administration, and among other stakeholders. Russia has not reversed its occupation and annexation of Ukraine’s Crimea region, nor has it stopped fostering separatism in eastern Ukraine. On the contrary, it has extended military operations to the Black Sea and the Azov Sea bordering Ukraine and Russia. With respect to other malign activities, the relationship between sanctions and Russian behavior is difficult to determine. Nonetheless, many observers argue that sanctions help to restrain Russia or that their imposition is an appropriate foreign policy response regardless of immediate effect. 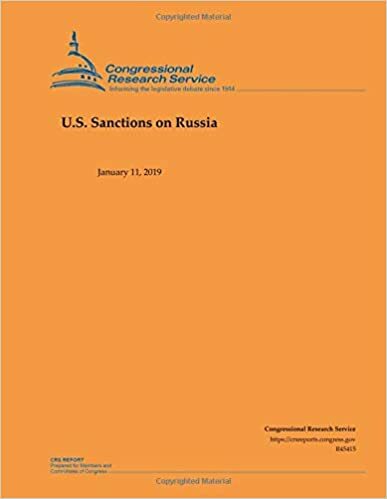 In the 115th Congress, several bills were introduced to increase the use of sanctions in response to Russia’s malign activities. The 116th Congress may continue to debate the role of sanctions in U.S. foreign policy toward Russia.